In recent years, increased concern about global warming and climate change has made it desirable for roadwork engineers to tackle environmental issues. In addition, there are also concerns that the emerging environmental issue known as the “urban heat island” phenomena, which significantly affects pedestrians as well as asphalt surfaces, may be associated with paved roads in urban areas. In order to tackle this problem from a paving perspective, solar heat-blocking pavement technology was developed to achieve the following benefits: a reduction in surface temperature, and mitigation of urban heat. This paper describes the environmental and practical effects of this technology through its development and application, with the following conclusions being drawn from this study. With regard to the temperature, field results show that the reduction in surface temperature through use of the solar heat-blocking pavement is approximately 16℃. In terms of serviceability, its application to airport taxiways reveals that this technology effectively curtails rutting, since the rut depth is reduced to about half, compared to dense-graded asphalt surfaces. Finally, computer simulation results indicate that solar heat-blocking pavement is likely to be useful in mitigating the “urban heat island”effect, since atmospheric temperatures can be decreased by 0.8℃ in urban areas. In recent years, the increase in temperatures during summer has become a serious problem in Japan. In particular, as the surface of asphalt pavements may reach 60℃ in summer, it is thought to be a factor in the “urban heat island phenomenon” which significantly affects the thermal comfort of pedestrians. In addition, high surface temperatures influence the performance of pavement surfaces, such as in terms of rutting, aging and fatigue . Bearing in mind these problems, it can be said that a reduction in surface temperature has become an increasingly important issue, in terms of sustainability as well as the environment. Past studies have indicated that making surfaces lighter to reflect both visible and infrared rays (i.e. sunlight) is the most practical way of mitigating road heat[2,3,4]. However, out of consideration for driver visibility, dark surfaces such as black or grey are preferable, since drivers are used to such surfaces. In addition, taking into account onsite workability during construction, surface treatment based on paint coatings is a practical way to handle the issue on existing surfaces. For these reasons, a new surface treatment technology called “solar heat-blocking pavement” is developed and applied in anticipation of reducing surface temperatures and mitigation of urban heat [5,6]. This paper highlights the basic concept behind the technology and addresses the environmental and practical effects through experiments and computer simulation. The basic concept behind this technology is to coat the developed material onto the existing surface so as to enable reflection of the solar and infrared rays (see Figure 1 and Figure 2). The function of the material is based on higher reflectivity for near-infrared rays and lower reflectivity for visible rays. In general, reflectivity of solar and infrared rays is represented by “albedo” . Higher albedo means that the pavement surface reflects infrared rays from the surface, whereas lower albedo indicates that the pavement easily absorbs infrared rays. 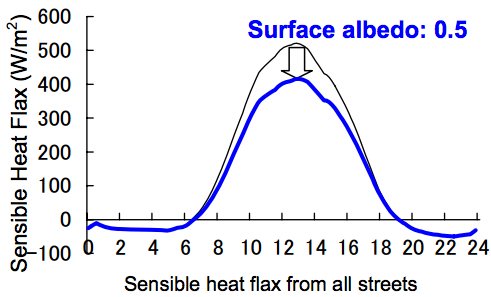 Thus, a higher albedo surface is desirable to prevent heating, whereas a pavement surface with lower albedo would result in an increase in surface temperature. Therefore, a solar reflective pigment was developed to prevent absorption of infrared rays at the surface. Also, fine hollow ceramic particles are mixed with the materials. The details of the particles are described in the following section. In order to examine the albedo characteristics, a comparison was made between three surfaces: solar heat-blocking pavement, conventional pavement (i.e. dense-graded asphalt pavement) and normal paint material. The test was conducted in accordance with the Japanese standard, JIS A 5759 . In this case, the color for both the solar heat-blocking pavement and the normal paint is grey, whilst that of the conventional pavement is black. Figure 3 shows the comparison results. 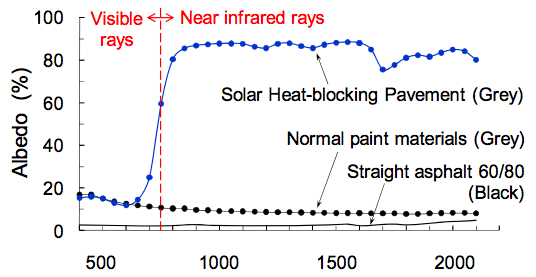 As shown in the figure, there are clear differences between the solar heat-blocking pavement and conventional painting materials. Conventional painting material has almost the same or a less reflective ratio across the entire wavelength. However, in the case of the solar heat-blocking pavement, the reflective rate for near-infrared rays in the wavelength is much higher than others. This indicates that the solar heat-blocking pavement has higher albedo, despite the fact that the normal paint material is the same color as the heat-blocking pavement. As mentioned above, the solar reflective pigment itself can reflect solar radiation back into the atmosphere. However, there is some concern that the reflected solar radiation may heat surrounding buildings, which would not mitigate the urban heat island effect. Therefore, it is necessary for the solar reflective pigment to have recursive reflection properties. The fine hollow ceramic particles enable the solar reflective pigment to have such function. The particles have a spherical structure 5 to 150 μm in diameter (see Figure 4). By mixing the particles with the solar reflective pigment, recursive reflection properties were expected of the solar reflective pigment. Gomado et al. investigated the recursive reflection property of Solar Heat-blocking Pavement . They used artificial sunlight and a specific sensor which measures reflected near-infrared rays, and a series of experiments was conducted by changing the directions of the sunlight and sensor. As a result, it was proved that the near-infrared rays were reflected back in the same direction as those of sunlight. Although the effect of fine hollow ceramic particles was not directly investigated, the result may explain the recursive reflection property of the ceramic particles. In general, the performance of solar heat-blocking pavement depends on the state of the coated layer. Therefore, it is important to evaluate the performance of the coated layer before site application. This section describes the laboratory evaluation methods of solar heat-blocking pavement and its results, looking at six properties: surface temperature; skid resistance, stripping resistance, odor, weather resistance and permeability. In order to investigate the reduction in temperature when using solar heat-blocking pavement, laboratory lamp irradiation experiments were carried out, as per the Japanese pavement performance reference . The schematics and experimental results are shown in Figures 5 and 6.
reaches 60°C in about three hours, is applied for the test. As can be seen from Figure 6, the results clearly show the difference between the two specimens. Although the result is necessarily the same as the site temperature, laboratory lamp tests are often used to confirm the performance of solar heat-blocking pigment before site application to predict the on-site performance.
. The results are shown in Table 1. From this result, it was found that the skid resistance values of the two surfaces are almost identical. However, as described in the following sections, nonskid sand is sprayed on immediately after the primary and secondary coating to ensure skid resistance. Therefore, it can be said that an appropriate amount of sand needs to be sprayed on to ensure the skid resistance. Considering the service state, the coating layer of solar heat-blocking pavement should be strong enough and have good bonding to the original asphalt surface. In order to investigate these factors, laboratory stripping resistance tests were conducted. A schematic representation of the test equipment is shown in Figure 7. After the test, a digital image of the specimen’s surface was taken with a digital camera. Then, the stripping resistance of the solar heat-blocking layer is evaluated by computer image analysis which can record the stripped area of the surface. The result is shown in Table 2. Compared to the performance criteria set by one organization, the coated layer demonstrates strong adhesion to the existing surface. However, the stripping state depends on the original condition of the surface as well as the solar heat-blocking material. Therefore, in practice, the stripping state needs to be evaluated in every construction job. Solar reflective material contains Methyl Methacrylate (MMA) resin. If applying solar heat-blocking material in urban areas, there are some concerns that the smell of the material may affect people living nearby. Therefore, the emission of odors should be minimized as much as possible during construction. In such case, a less odorous type of material (i.e. odor-reduced resin) can be selected as the solar heat-blocking material rather than conventional material. 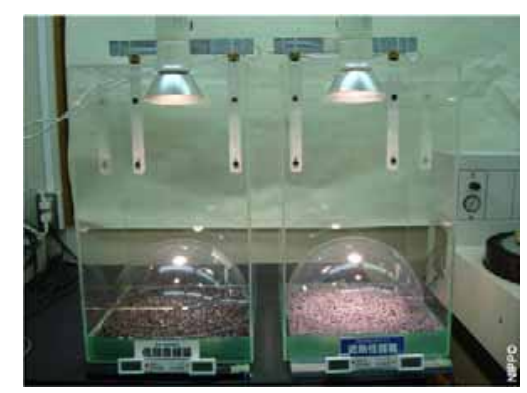 In order to evaluate this effect before construction, odor testing is conducted in accordance with laboratory odor measurement method . The test equipment is shown in Figure 8. Table 3 shows the measurement results. These results clearly show the difference between conventional and odor-reduced materials. The odor level for the conventional material is about four times that of the odor-reduced type. Also, the odor-reduced material meets the requirements set by the organization. In addition, the same surface performance as conventional material has been confirmed for the odor-reduced material. Therefore, it is possible to construct solar heat-blocking pavement even in urban residential areas if the odor-reduced type of material is selected for the solar heat-blocking pavement. Table 4 shows the results of the accelerated weathering test for the specimens. The results showed a good trend as the weather resistance ratio was approximately 94 percent after 3,000 hours. In addition, in terms of solar radiation, the solar reflective ratio, as per JIS A 5759 , was 48.1 percent. This was less damage than the initial condition recorded of 51.2 percent. Therefore, it can be said that the solar heat-blocking pavement affords good weather resistance. 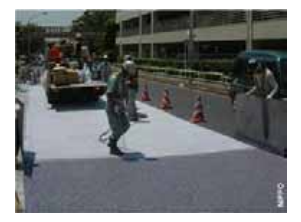 Porous asphalt surface has been the most popular type used in Japan. Considering the recent application of porous asphalt pavement, it is likely that solar heat-blocking materials will be applied to porous asphalt surfaces as well as conventional dense-graded surfaces. The advantage of the porous asphalt surface is that it reduces rain spray, in addition to cutting tire noise. ・The permeability of the asphalt mixture is determined by calculating the volume of water flow per 15 seconds. Table 5 shows the test results for both normal and coated asphalt surfaces (i.e. 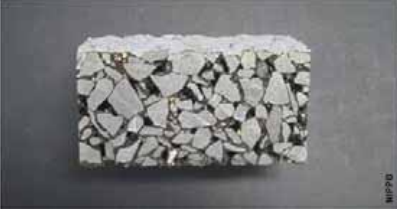 porous asphalt with solar heat-blocking material). In terms of permeability, the normal porous asphalt surface drained at 1,222 cc/15 seconds, whereas the coated porous asphalt surface drained at 1,210 cc/15 seconds. This result suggests that the coated porous asphalt surface is permeable enough, even though the solar heat-blocking materials cover the existing surface. As a result, it is possible to apply solar heat-blocking material to porous asphalt surfaces since the coated surface satisfied permeability requirements. Solar heat-blocking pavements can be constructed by applying the developed solar reflective pigment to existing surfaces. In practice, MMA resin is used as the solar reflective material. The MMA type includes a two-component resin. The coating layer is about 1.0-mm thick and consists of three components: priming layer, secondary layer and nonskid sand (see Figure 9). Firstly, the priming layer is applied to cover the existing surface and to attach the ceramic particles to the surface; then the nonskid sand is sprayed on immediately after the primary coating to ensure skid resistance; and finally, the secondary layer is applied as the colored surface and to sandwich the nonskid sand. After curing for an hour, the site can be reopened to traffic. The coating work is normally performed with a specialist spray gun as shown in Figure 10. In order to examine the effect of temperature reduction, conventional pavement (i.e. dense-graded asphalt pavement) and solar heat-blocking pavement were compared in the field. The traffic classification of the field is more than 250 and less than 1,000 vehicles/day for heavy traffic. Figure 11 shows the temperature of the two surfaces. It can be seen that the maximum surface temperature of the solar heat-blocking pavement was approximately 42℃, whilst that of conventional pavement was around 58℃; the difference between the two surfaces reaching about 16℃. Therefore, the result clearly shows the advantage of the solar heat-blocking pavement in reducing the surface temperature in summer. 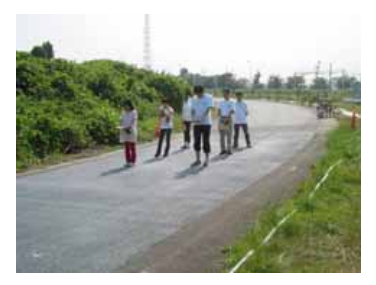 The performance of solar heat-blocking pavement was demonstrated in the field. However, considering its long-term performance and further improvements in the technology, it is necessary to examine its durability as well as the surface temperature under severe traffic conditions and prolonged periods. 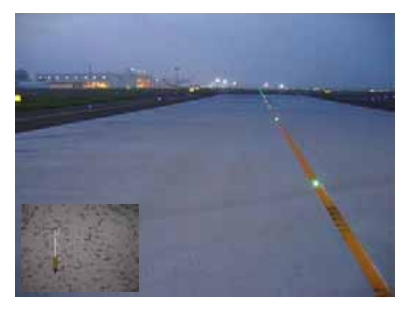 In order to investigate these effects, solar heat-blocking pavement was applied to the taxiway of an international airport (see Figure 12). Rut depth for the two surfaces (i.e. dense-graded pavement and solar heat-blocking pavement) was measured during regular monitoring. 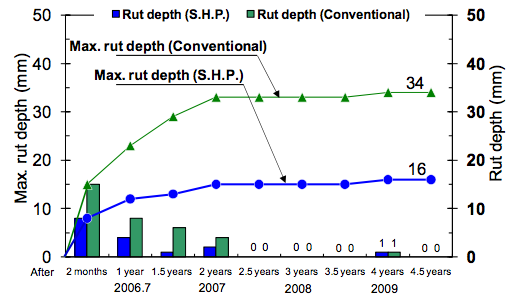 Figure 13 compares the maximum rut depth of the two pavements during the four-year monitoring period. As can be seen from the figure, the solar heat-blocking pavement can reduce the maximum rut depth by half, when compared to that of dense-graded pavement. As a result, a clear difference is evident between solar heat-blocking pavement and dense-graded pavement, in terms of rut depth. Therefore, it can be said that the solar heat-blocking pavement is an effective means of improving rut resistance [16, 17]. In the case of applying the solar heat-blocking material to the porous asphalt surface, there are also some concerns about noise reduction. This is because the materials may clog up the air voids in the porous asphalt surface. Therefore, tire noise measurements were conducted on the porous asphalt surface before and after coating with these materials. A schematic representation of the noise measurement is shown in Figure 14. The noise from the surface is measured using a vehicle equipped with a microphone. The measurement was conducted at a speed of 50 km/h. Table 6 shows the results of the noise measurements. From these results, it was found that the existing porous asphalt surface reached 88.3 dB (A), whereas the porous surface coated by the solar heat-blocking material achieved 87.9 dB (A). Tomonaga et al. also conducted the same investigation and also recorded a similar result (see Table 6) . As a result, it can be said that the porous asphalt pavement coated with solar heat-blocking materials retains its original performance levels, despite the materials being coated on top of the existing porous asphalt surface. In order to investigate how solar heat-blocking pavement improves the thermal sensation, a comparative trial was conducted on a hot summer’s day when the external temperature ranged between 30°C and 35°C. Under these conditions, the unshaded pavement surface temperatures were found to vary by as much as 12°C. Figures 15 and 16 show the photographic and thermographic images of two similarly clothed men standing on a test bed of the two surfaces. Comparing the two images, it is apparent that the surface temperatures of the two pavements were significantly different. As shown in Figure 16, the conventional surface is colored white in the sunny areas, which indicates a surface temperature of more than 51°C, whereas the solar heat-blocking pavement is a reddish-orange hue, representing a surface temperature of around 46.5°C. 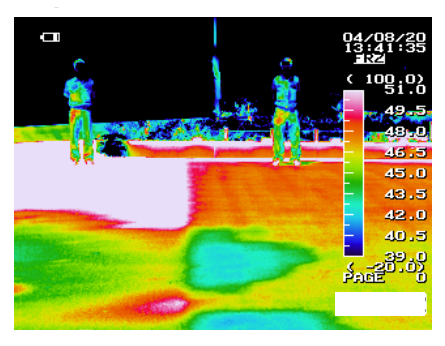 The effectiveness of the solar heat-blocking pavement is evident from the thermographic image. Tomonaga et al. also conducted a similar investigation, and they also concluded that the heat radiated from the solar heat-blocking pavement is less than that from conventional porous asphalt pavement . Therefore, it can be said that solar heat-blocking pavement contributes to an improved thermal sensation, especially around the feet. A survey concerning human sensation was conducted. Six assessors (i.e. three males and females in their 20’s to 30’s, respectively) were chosen at random. 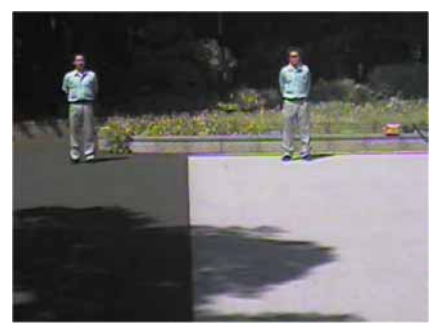 Also, the assessors checked the sensation when standing on both conventional and solar heat-blocking pavement for three minutes, respectively (see Figure 17). The ambient air temperature was approximately 35°C. Questions the assessors answered in the survey concerned the thermal impact around the body and feet, and how sweaty they felt. Summarized results from the questionnaire are shown in Figure 18. For conventional pavement (i.e. dense-graded asphalt pavement), 35 percent of the assessors adjudged the surface to be “very hot”. Including those who answered “rather hot”, almost all assessors recognized conventional pavement as hot, whereas for the solar heat-blocking pavement, some assessors identified that surface to be “cool” or “rather cool”. 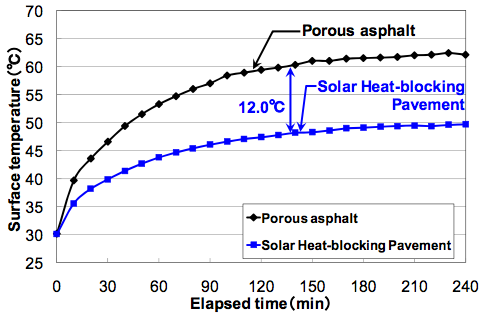 Figure 19 presents comparisons between conventional pavement and solar heat-blocking pavement from the questionnaire. From these results, 19 percent of the assessors judged conventional pavement as comfortable, while 62 percent of them considered solar heat-blocking pavement as comfortable. Kinouchi et al. also investigated the impact on human thermal sensation using WBGT . From their research, it was found that a high albedo pavement provides a more comfortable feeling than lower albedo pavement. Therefore, it can be said that solar heat-blocking pavement mitigates thermal sensation around the feet. Although the surface temperature can be reduced by the solar heat-blocking pavement, it is difficult to verify how the pavement contributes to the reduction in atmospheric temperature in urban areas. In order to examine the influence of surface type on atmospheric temperature, laboratory tests were conducted. The conditions of the laboratory tests are shown in Figure 20. 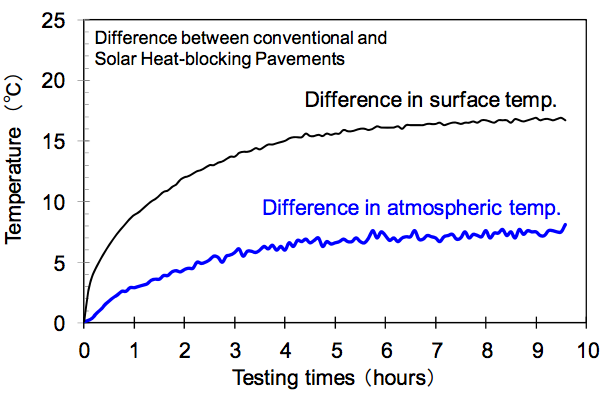 In this test, a comparison was made between conventional pavement and solar heat-blocking pavement. 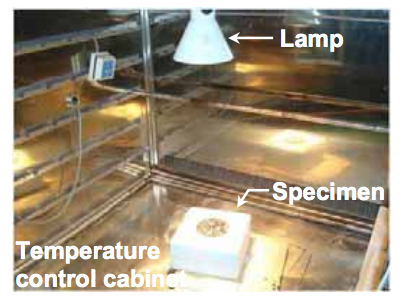 The test was conducted by shining light as artificial sunlight onto slab-type specimens in a cabinet; both surface and atmospheric temperatures were measured simultaneously by thermo-couples. Figure 21 illustrates the relationship between temperature reduction and the test duration. As can be seen in the figure, the results clearly demonstrate the advantages of the solar heat-blocking pavement in terms of both surface temperature and atmospheric temperature. This demonstrates that the solar heat-blocking pavement is likely to be useful in mitigating the “urban heat island” effect. 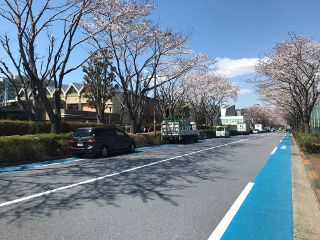 ・With regard to the performance of solar heat-blocking pavement, the surface temperature is reduced by approximately 16℃ compared to conventional dense-graded asphalt paving due to the prevention of solar radiation. ・Solar heat-blocking pavement can effectively reduce rutting, as the rate (based on rut depth) was approximately half compared to the dense-graded asphalt surface used at an airport taxiway. ・In terms of the thermal sensation for pedestrians, the results of questionnaires demonstrate that the solar heat-blocking surface contributes to improving the thermal sensation around their feet. ・From the view of laboratory experiment, this technology would be highly effective in alleviation of “urban heat” since a comparison between conventional and solar heat-blocking pavements shows advantages both in surface and laboratory atmospheric temperatures. ・With respect to computer simulations, the results indicated that solar heat-blocking pavement is likely to be useful in mitigating the “urban heat island” effect, since atmospheric temperatures can be reduced by 0.8℃ in urban areas. The effect of the solar heat-blocking pavement was shown through field experiments and application. However, it is difficult to verify how solar heat-blocking pavement may contribute to the reduction of urban heat wave. In order to investigate such effect, a computer simulation was conducted by Kinouchi et al. . 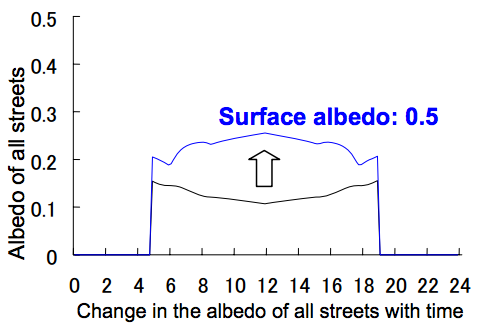 In this simulation, it is assumed that solar heat-blocking pavement is applied to central Tokyo, and the albedo increases from 14% to 60%. A sunny day in summer is assumed. The ranges of temperature change are assumed to be 366 × 366 [km] as the main domain (Kanto area) and 114 × 114 [km] as a nest domain (center of Tokyo). The temperatures at a height of 1.5 m above the ground will be calculated. The changes in air temperature due to the use of solar heat-blocking pavement are shown in Figure 22. The result indicates that air temperatures in central Tokyo tend to decrease. Also, the air temperature is reduced by more than 0.8°C due to the reduction in surface temperature. Thus, this technology is highly effective at mitigating urban heat islands. In addition, calculations of sensible heat flux in the streets were carried out in case of increasing the surface albedo. In this case, the following condition was assumed for the simulation; air temperature is 35°C; wind velocity is 5 m/s; surface albedo is 0.1 and 0.5. The schematic of the simulation model is shown in Figure 23, and the calculation results were shown in Figures 24 and 25. As can be seen in the results, the amount of sensible heat in the streets, which heats the atmosphere, decreased due to the increased reflectivity. As a result, the reduction in air temperature in the streets improves the urban heat environment. There fore, it can be said that the effect of heat reduction is greater due to retro reflection. Solar heat-blocking pavement has to be improved and enhanced to tackle global warming and climate change. However, considering the long-term durability and life-cycle costs of roads with solar heat-blocking pavement, there are still some concerns about the technology. Therefore, further research looking at these issues is needed to build sustainable roads in the future. 1. Yoder, E.J. and Witzak, M. W. (1975) Principles of Pavement Design, New York, NY, Wiley and Sons. Temperature in Large Cities, LBNL-43442, Lawrence Berkeley National Library. Savings: Durability and Illumination, LBNL-45370, Lawrence Berkeley National Library. pavement, Proc. 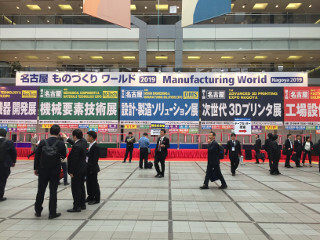 of 25th Japan Road Conference, No.09P04, (in Japanese). Environment, D.Eng Thesis, Nagaoka Institute of Technology (in Japanese). Industrial Material, Vol.46, No.5, pp.35-38, (in Japanese). 9. JIS A 5759 (1994) Adhesive films for glazings. Type) for Exposure of Nonmetallic Materials. Pavement, Journal of Pavement, Vol. 43-6, pp.31-36 (in Japanese).